Considering braces or Invisalign to straighten your teeth? Many patients have questions regarding these different treatment options. What is more affordable? Will Invisalign be as effective as braces? What is the best treatment choice for my teeth? At Reagin Orthodontics, we want all of our patients to have an incredible experience and finish their orthodontic treatment with the best result possible. Traditional braces have come a long way over the years. They are sleeker, smaller and more comfortable. 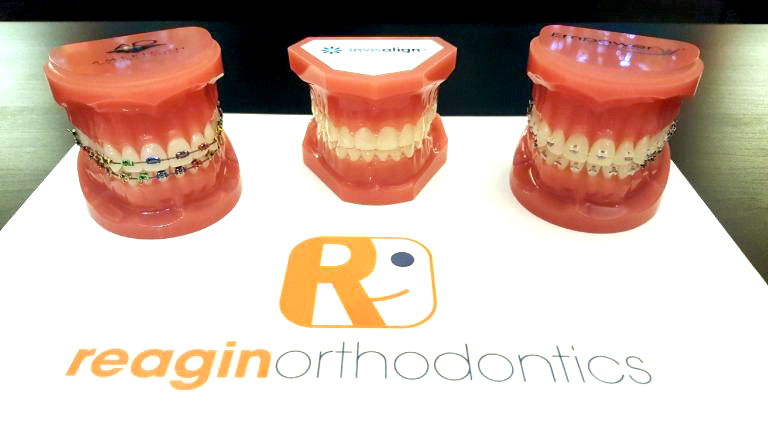 At Reagin Orthodontics we use high quality American made brackets and that is certainly something to smile about! Traditional braces consist of small brackets bonded directly to the teeth with adhesive and a wire that connects them all together. They require periodic adjustments approximately every 6-8 weeks throughout the course of treatment to align the teeth. We offer metal brackets with a wide array of colored elastics and clear ceramic brackets for those looking for something less discrete! Clear aligner therapy, such as Invisalign, is an alternative to traditional metal braces. The clear aligner system is a series of customized, virtually invisible aligners that are designed to gradually move teeth over time. You may be surprised to learn the cost of Invisalign® treatment is comparable to braces! Dr. Reagin has spent extensive time learning how to use clear aligners to achieve the same results as braces and nearly 80% of our patients are able to select Invisalign as a treatment method. These aligners are removable which means there are no dietary restrictions, you can brush and floss normally, and there are virtually no emergency appointments needed! There are also fewer appointments required which mean less time away from work and school! You might be surprised to learn that the cost of Invisalign treatment is comparable braces.